1. The Steelpan: The only new acoustic instrument to be invented and accepted worldwide in the 20th century originated in Trinidad and Tobago. 2. Trinidad and Tobago is home to the world’s largest traffic roundabout around the Queen’s Park Savannah. 3. In 2006, Trinidad and Tobago became the smallest country ever to qualify for the 2006 Football World Cup. 4. Trinidad and Tobago contestant Ms Janelle Penny Commissiong was the first Black Miss Universe in 1977. 5. Trinidad and Tobago’s Brian Charles Lara holds the record for the highest individual score in a test innings (400 not out against England, Antigua 2004). He is also the only batsman to have ever scored a hundred, a double century, a triple century, a quadruple century and a quintuple century in first class games over the course of a senior career. 6. Trinidad and Tobago is one of the oldest hydrocarbon producers in the world, with commercial production dating as early as 1908. Trinidad and Tobago is also a major petrochemical hub and is one of the world’s largest exporters of ammonia, ethanol and liquefied natural gas. The two largest ethanol plants in the world are found in Trinidad. 7. The Leatherback Turtle: the largest of all living turtles chooses the shores of Trinidad and Tobago as one of its nesting grounds. Trinidad and Tobago is one of the most important leatherback nesting sites. 8. The Pitch Lake: The Pitch Lake in South Trinidad is the largest natural deposit of asphalt in the world. 9. Trinidad and Tobago is the birthplace of calypso, a style of Afro-Caribbean music that gained international popularity in the 1950s, primarily through the music of Harry Belafonte. 10. Trinidad and Tobago Carnival has been consistently ranked as one of the top ten Carnival celebrations in the world. It is popularly known as ‘The Greatest Show on Earth’. The founder of the Notting Hill Carnival, Europe’s largest street festival, Claudia Jones, also hails from Trinidad and Tobago. 11. The limbo dance originated as an event that took place at wakes in Trinidad and Tobago, but became internationally renowned through the work of Julia Edwards and her dance company in the 1960s. 12. The oldest rainforest reserve in the Western Hemisphere is located in Tobago. Little Tobago is home to the world’s largest brain coral. Trinidad and Tobago has over 400 species of birds, making it one of the richest birding countries per square mile. 13. Tobago was the location of Daniel Defoe’s classic Robinson Crusoe. Tobago is also widely believed to be the place Robert Louis Stevenson had in mind when he penned Treasure Island. 14. On August 1, 1985 Trinidad and Tobago became the world’s first country to declare a public holiday in commemoration of the abolition of slavery. 15. Trinidad and Tobago-born Stokley Carmichael (also known as Kwame Ture) was a member of the United States Civil Rights Movement who rose to prominence as the Honorary Prime Minister of the Black Panther Party. He popularized the term ‘black power’ as a social and political slogan. 16. The only national to serve as Prime Minister and President of Trinidad and Tobago, ANR Robinson was instrumental in the establishment of the International Criminal Court (ICC) during his tenure as Prime Minister from 1986-1991. In 1989, during the 44th session of the UN General Assembly, Prime Minister Robinson proposed the creation of the court, which was eventually inaugurated in 2002 to hear cases of crimes against humanity. 17. Trinidad and Tobago’s Dr Joseph Lennox Pawan achieved international acclaim for the discovery of the transmission of the rabies virus by vampire bats. This led to the development of a vaccine for the virus. 18. Born in Trinidad and Tobago in 1878, Eugene Chen left behind a successful career and moved to China where he founded the Peking Gazette. Chen later became the Foreign Minister to four successive governments and the personal adviser to Sun Yat-Sen, the founder of Nationalist China. 19. The Trinidadian accent ranks 10th on the CNN’s top ten sexiest accents in the world. 20. In 2013, the Trinidad Moruga ‘Scorpion’ Pepper has officially been ranked as the world’s hottest pepper by the Guinness Book of Records. 21.Trinidad & Tobago is the 6th Country in the world with the most holidays. 17 Holidays. No wonder we came in the Top 10 ' happiest' countries in the world. 1. ARIMA is the Amerindian word for “water”. It was so named as the village was built around a river. 2. AROUCA is based around the word “Arauca”, which is the true name for the so-called Arawak. 3. The adjacent beach, BALANDRA, is named after a type of boat that docked there. 4. BARATARIA is possibly named after a prank involving a fake island of the same name in Cervantes’ Don Quixote. “Barato” itself means cheap. 5. BICHE is named after the French word for “beast” because it was first started off as a settlement for hunters. 6. The settlement was first called Ladies River, but later on a French surveyor named it after the French term for “washer-woman” -BLANCHISSEUSE. 7. When boats were docked in Port-of-Spain, they were carried along the bay to be cleaned. This was called “careening” and so sprang the name CARENAGE. 8. CAURA was based off of an Amerindian word “Cuara” which meaning is lost now. The settlers of Caura were said to be so lazy and secluded that their village never thrived and was left mostly abandoned. A CORRECTION MADE BY A DESCENDANT FROM THE CAURA AREA: Caura ancestors were not lazy. They carried their church brick by brick to the Lopinot Valley. A dam scheduled there was never built and the Government never gave them back their land. 9. When the Spanish sailors arrived at this coast, they noticed many tall cedar trees. And they called it the Spanish word for cedars, CEDROS. 10. CHAGUANAS is named after the group of indigenous peoples that lived there, known as the Chaguanes. Smaller villages in Chaguanas were so named to positively motivate its early settlers - Felicity, Endeavour, Enterprise. 11. 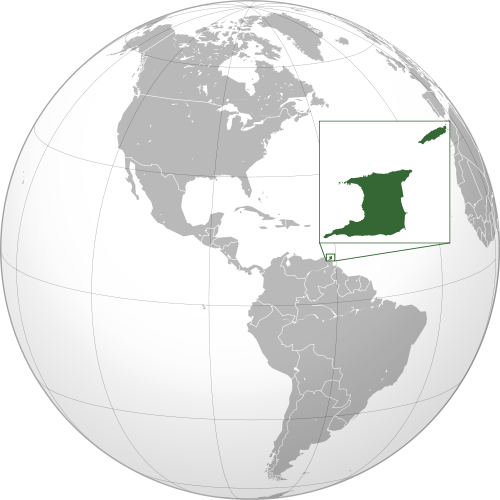 COUVA was a corruption of Cuba, due to the tendency to pronounce “B” as “V” in the Spanish language. 12. CUNUPIA is named after the Spanish word “conupia”, which when translated means “canopy”. 13. DIEGO MARTIN is simply named after the Spaniard who discovered it, Don Diego Martin. 14. FIFTH COMPANY VILLAGE is so named after the temporary settlement of the 5th company batch of black American soldiers who stayed here during the war of 1812. 15. The villagers were very pleased when a man named Clifton Flanagin came and built a successful railway system, and thus changed the name of their village to FLANAGIN TOWN. 16. The indentured labourers from Uttar Pradesh named FYZABAD after a province they lived next to, known as Faizabad. 17. The first spot sighted by Columbus. This spot may also be known as GALEOTA POINT, which means “galley”, as Columbus believed it to look like a galley under sail. 18. GUAYAGUAYARE was named after the indigenous mocking the sounds of the sea at that point. 19. An icaco shrub, more commonly known as “fat pork”, provided the inspiration for the name, ICACOS. 20. When Sir Walter Raleigh patched his ship up with the pitch from the Pitch Lake, he gave the village the name LA BREA, which simply means “The Pitch”. 21. LAVENTILLE is a corruption of “La Ventaille” (or The Vent), so named for the passage of the northeast trade winds through this area. 22. A new incoming Governor by the name of James Longden was determined to leave his mark on this country and so had a town named after him, called LONGDENVILLE. 23. In the 1700’s, a young man from Louisiana travelled to Santo Domingo. When war involving Touissant Louverture broke out, he sneaked into a ship, which then carried him to Trinidad. He settled in a spot there after being granted a parcel of land for cocoa. The man’s name was Charles Joseph Count de LOPINOT. 24. Along the coast there are tiny fruits known as manchineels. They are small and poisonous and look like tiny apples. The village near this coast was given the Spanish word for “little apple”, which is MANZANILLA. 25. When the Spanish visited here, they came for the seaside view. It was described as “Mar Bella”, or ‘beautiful sea’, which was later turned to MARABELLA. 26. MARACAS was so named after the musical instrument, which we sometimes call the “chac-chac”. 27. MATURA is the Spanish word for “high woods”, named by the surveyors visiting there. 28. The maya plant grew prolifically in MAYARO. The word “ro” in the Amerindian language meant “the place of”, so Mayaro denotes “the place of the maya plant”. 29. A place renowned for having spirits, MORUGA was named after a river lined with abandoned fishing settlements, with many of the villagers claiming that an apparition dwelled in the waters. 30. NAPARIMA is named from the Amerindian word “Anaparima”, which means “single hill”. 31. Due to the nearby presence of the Oropouche Lagoon and rice paddies, the dwellers took to calling the village “pengyal”, which in Tamil means “swampy area”. This was later renamed PENAL. 32. POINTE-A-PIERRE was only so named because of its French settlers - Pierre being a popular French name. 33. A man with no recorded first name, simply called Fortin, was granted land in Trinidad. It was then called POINT FORTIN. 34. PORT-OF-SPAIN, or formerly known as “Port of the Spaniards”, was a regular meeting place for Spanish sailors. Before, it was known as Cu-Mucurapo, which means “The Place of Silk Cotton Trees”. 35. Originally called the Mission of Savana Grande, the town was renamed PRINCES TOWN after a visit by Queen Victoria’s grandsons, Prince Albert and Prince George. They had each planted a poui tree near an Anglican Church, which still can be seen today. 36. RIO CLARO was named by Spanish surveyors. In English, it means “Clear River”. 37. SAN FERNANDO was so named by Governor Chacon after the infant son of Spanish King Carlos III, Prince Fernando. 38. There was a river that the Spanish saw that ran red as blood. So they named the villages near the river SANGRE GRANDE and SANGRE CHIQUITO, respectively “Big Blood” and “Little Blood”. 39. After the Arena Massacre of 1699, the Catholic parish at that area decided to give it the name SAN RAFAEL, after St. Raphael, the patron saint of healers. 40. SANTA CRUZ simply means “Holy Cross” in Spanish due to the religious zeal of the settlers there. 41. “Little Savannah” in Spanish is SAVONETTA, an early settlement for French planters. 42. SIPARIA is also known as The Sand City. 43. ST. JOSEPH was originally named after its founder, St. Jose de Oruna. It is notable that it was the first established town in Trinidad. 44. TRINCITY is a blend between Trinity and City. NEW YORK DAILY NEWS:Trinidad is unlike all other Caribbean islands. 1. Tobago only has 6% of the total area and 4% of the total population of this dual-island nation. 2. Trinidad was named by Christopher Columbus on his third voyage to the New World in 1498. 3. Trinidad and Tobago is one of the most important leatherback nesting sites. 4. Tobago got its name because it resembles a tobacco pipe (tavaco) used by local natives. 6. The Pitch Lake in South Trinidad is the largest natural deposit of asphalt in the world. 8. The Steelpan: The only new acoustic instrument to be invented and accepted worldwide in the 20th century originated in Trinidad and Tobago. 10. The dances “limbo” and “calypso” were created in T&T. 11. Trinidad and Tobago’s Dr Joseph Lennox Pawan achieved international acclaim for the discovery of the transmission of the rabies virus by vampire bats. 12. The Trinidad Moruga “Scorpion” Pepper has officially been ranked as the world’s hottest pepper by the Guinness Book of Records. 13. The oldest rain forest reserve in the Western Hemisphere is located in Tobago. 14. Education in T&T is entirely free, contributing to the over 98% literacy rate. Children are expected to have basic reading and writing skills before starting school at age 5. Most start preschool at 2 ½ years of age. 15. The world’s largest brain coral is located in Tobago. Check out some awesome diving in my Guide to Dahab. 17. The novels “Robinson Crusoe” and “Treasure Island” were based on these islands, and the movie “Swiss Family Robinson” was filmed here. 18. T&T is one of the world’s leading exporters of natural gas.